Cadair Berwyn Mountain or HillCadair Berwyn is the highest summit in the Berwyn range (Y Berwyn or Mynydd y Berwyn), an isolated and sparsely populated area of moorland located in the north-east of Wales, roughly bounded by Llangollen in the north-east, Corwen in the north-west, Bala in the south-west, and Oswestry in the south-east. The area is wild and largely vegetated by heather about one metre thick, with some acidic grassland and bracken. It is not very popular for hill-walking or scrambling since the peaks are lower than those in nearby Snowdonia. However, the topmost peaks are rugged and have a distinctive character well worth exploring. Nearby towns include Llangollen and Corwen, which are popular tourist destinations. 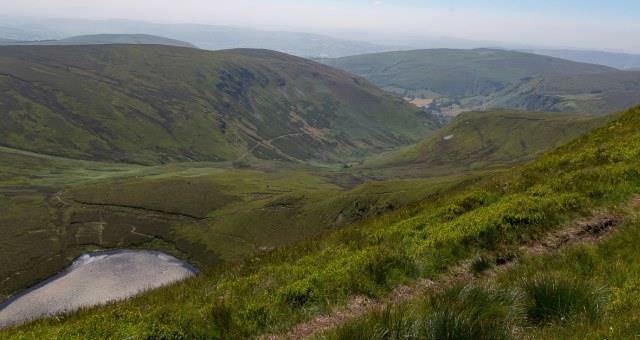 The main summits are Cadair Berwyn at 830 metres (2,723 ft) above sea level, Moel Sych at 827 metres (2,713 ft) and Cadair Bronwen at 784 metres (2,572 ft). The Berwyn range is crossed to the south-west by the B4391 Milltir Cerrig mountain pass at an altitude of 486 metres (1,594 ft). Cadair Berwyn is the highest summit in the Berwyn range (Y Berwyn or Mynydd y Berwyn), an isolated and sparsely populated area of moorland located in the north-east of Wales, roughly bounded by Llangollen in the north-east, Corwen in the north-west, Bala in the south-west, and Oswestry in the south-east. The mountain lies on main ridge of the Berwyns which runs north-south. The eastern side of the ridge is characterised by steep drops and crags including Craig Berwyn north of the summit and Craig y Llyn to the south. Craig y Llyn forms the headwall of a cwm, and it is to this that the word cadair (chair in Welsh) presumably refers. 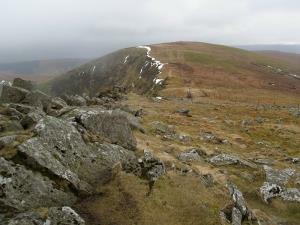 Further north along the ridge is Cadair Bronwen, whilst to south the ridge continues to Moel Sych meaning 'dry hill'. Cadair Berwyn can be accessed via Pistyll Rhaeadr which is north-west of Llanrhaeadr-ym-Mochnant, on the B4580. Drive through the main square past the Wynnstay Arms and turn right into Waterfall Street just before Greatorex, the corner shop; the waterfall is signposted above the shop. Continue along Waterfall Street for four miles until the road ends at the waterfall.